A man walks into his back yard one morning and finds a gorilla in a tree. He calls a gorilla-removal service, and soon a serviceman arrives armed with a stick, a Chihuahua, a pair of handcuffs and a shotgun. “Now listen carefully,” he tells the homeowner. “I’m going to climb the tree and poke the gorilla with this stick until it falls to the ground. The trained Chihuahua will then go right for his, uhm, sensitive area, and when the gorilla instinctively crosses his hands in front to protect himself, you slap on the handcuffs.” “Got it,” replies the homeowner. 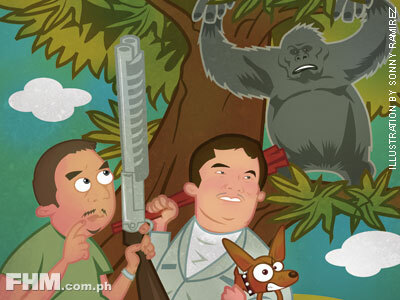 “But what’s the shotgun for?” “If I fall down from the tree before the gorilla,” begins the serviceman, “shoot the Chihuahua.